For many companies, generating high-quality email addresses (leads) for their database is an essential part of their B2B marketing strategy. However, B2B marketers often struggle to tackle this effectively. How can you ensure that an anonymous visitor leaves their email address in exchange for more information? 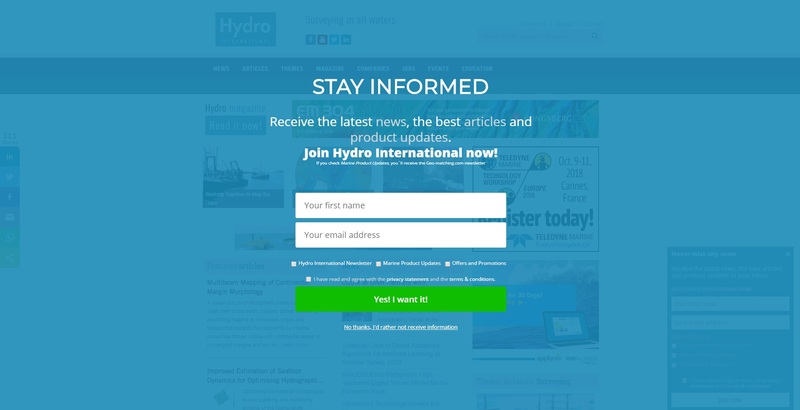 For two of our industry websites, gim-international.com and hydro-international.com, we tested various pop-ups between January and June 2018, and we discuss the results in this case study. Both websites have a very informative approach. 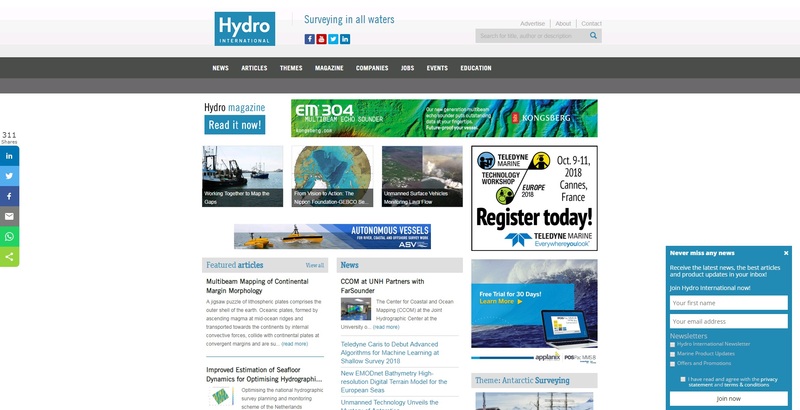 They are used by industry professionals from the geomatics and hydrography sectors to gather news, insights and knowledge about their areas of work. A call to action (CTA) to encourage them to leave their email address therefore had to be focused on these goals. 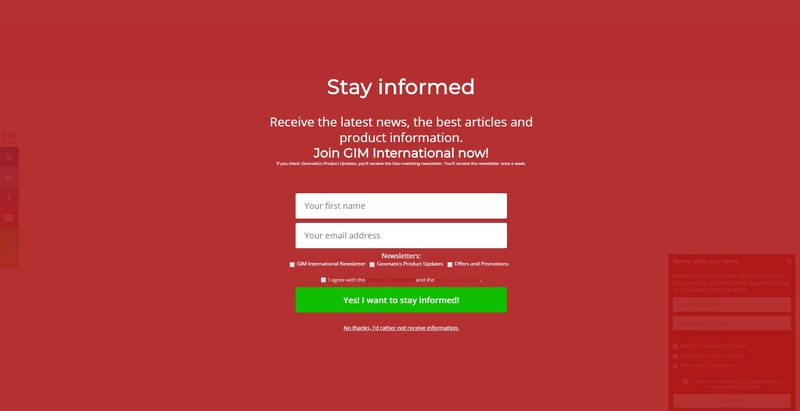 After extensive testing, we rolled out two variants: ‘Never miss any news’ and ‘Stay informed’. These CTAs were presented as two pop-ups: a slide-in and a full-screen version. A slide-in is a subtle pop-up that appears after a few seconds, at the bottom right of the visitor’s screen. This version causes minimal disruption to the web experience and visitors can continue reading quite easily. The disadvantage, however, is that the call to action is not particularly big – and that is clearly reflected in the results. This is a screen-filling pop-up that cannot be ignored by visitors. Traditionally this is a lead generator with a high conversion rate, but also one that needs a careful plan to avoid causing irritation. After extensive testing, we decided to use and exit-intent pop-up, which appears as soon as someone moves their cursor towards the cross in order to leave the website. 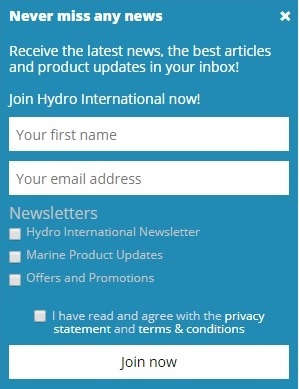 When the reader clicks on the pop-up’s cross or on ‘no thanks, I’d rather not receive information’, the pop-up will not be displayed to them again for the next 30 days. This function is used significantly more with the full-screen exit-intent than with the slide-in, which results in a big difference in impressions. In total, the slide-in generated 1,076 leads with a conversion rate of 0.43%. The full-screen version generated 1,757 leads with a conversion rate of 1.38%! Naturally, to help us make our campaigns as effective as possible, we also keep track of the sources of the leads. Notably, the majority of the leads (46%) come from organic search traffic! Another striking result is email’s share (16%). At first glance this does not seem to be of much value. After all, aren’t those email addresses already in the database? 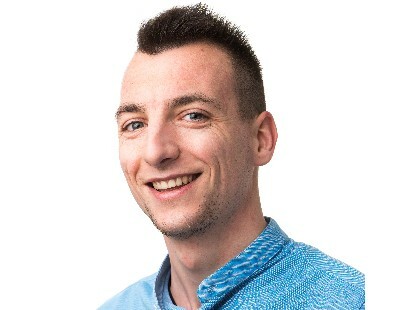 However, many of these leads come from forwarded emails, plus an extra confirmation of an existing email addresses is very positive in view of the strict new GDPR regulations. Do you need advice or help on technical B2B marketing issues? Feel free to contact us via [email protected]marketing.com or by phone! Become a B2B Marketing Expert! 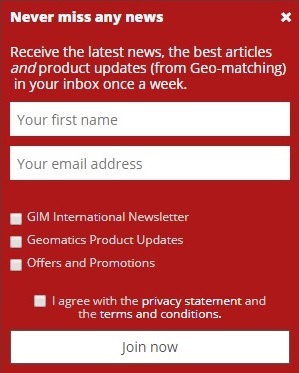 I want to receive the monthly Factrics newsletter. Marketing by facts, that’s what Factrics stands for! We help smart engineering companies to develop, execute and optimize effective digital B2B marketing campaigns.